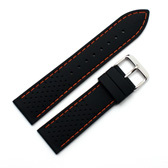 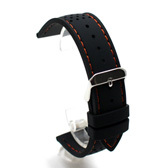 Finest Quality, made in Germany with a keen attention to detail, this matt black watch strap is made from soft, smooth, waterproof silicone embossed with a tropic-style pinhole pattern and with orange detail stitching. 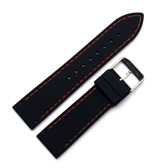 It is 4mm thick at the lugs and most suited to sports, racing or divers watches. This strap will fit any watch were the distance between the lugs is 18mm, 20mm, 22mm or 24mm (depending on the strap you buy). Like all of our products, it is brand new and in stock in the UK, ready for our super fast shipping.